Sometimes a girl just wants to kick back and relax with a fun and dumb movie. When I was younger, it was romantic comedies. Now that I have grown up and noticed romantic comedies have not grown with me, I have discovered the wonderful world of eighties action flicks. I think I might be channelling my inner teenage boy with these movies, but I don’t care. 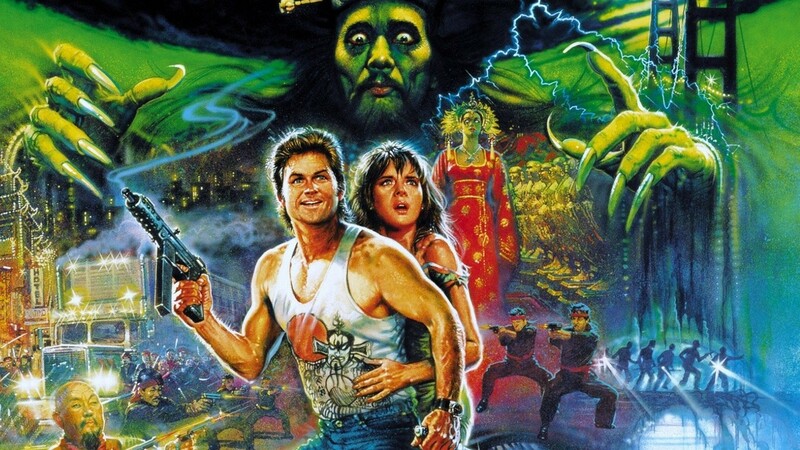 I like them even if they aren’t considered “high art” or even “good.” Big Trouble in Little China is the next addition to my current rotation of dumb action movies. Kurt Russell stars as a wise-cracking and philosophical trucker named Jack Burton. He travels to San Francisco to visit a friend in Chinatown. This friend goes to the airport with Jack to pick up his girlfriend from China. Literally while she is walking towards Jack’s friend, she gets kidnapped by some Chinese goons. Thus kicks off a movie length chase sequence that involves Kim Cattrall as Gracie Law (For some reason in this universe your occupation is also your last name), a two-thousand year old Chinese man with supernatural powers called Lo Pan, the secret underworld of Chinatown, crazy Chinese gang fights that involve amazing lightning effects coming out of a henchman’s eyes, and general Chinese mysticism. At the end of the day, Jack saves the innocent Chinese girlfriend as well as Gracie from the clutches of a very old Chinese man who has a fetish for green eyes and says some badass stuff along the way. A rollicking good time was had by all. Here are a couple of things to fully convince you that this is probably the best film of the eighties. Kurt Russell does a John Wayne impression for the entire movie, so when he says insane things like his speeches at the beginning or all of his catch phrases it has a delivery that makes what he says even funnier. He also rocks a Chinese tank top to show off his rippling muscles and to remind us all that this movie is in fact taking place in Chinatown. Each man in this movie has an affection for these green-eyed girls that borders on creepiness, but none of them surpass Lo Pan played brilliantly by James Hong. His performance should have won the Oscar for Best Supporting Actor because he was just so freaking amazing. Every time he appears on-screen and says something villainous I punch the air with excitement. Speaking of Lo Pan, his henchmen have some of the funniest CGI props ever committed to celluloid. I am sure it looked impressive at the time, but in 2014 when you see bright blue lightning coming out of someone’s eyes or a huge electric green glob of light above a building, you have to laugh. It is kind of requirement. I think that I might have just become a John Carpenter convert. I don’t think that I have ever had much interest in him until I saw this movie. His sense of comic timing, absurdity becoming believable and some badass action is so on point in this movie that I love him already. I am not joking here. If you want a good time, I would suggest popping some popcorn, kicking back and enjoying this movie.